The Black Hills area of western South Dakota is one of the most beautiful spots in the country, offering a plethora of activities for visitors, including two national parks, a national monument, multiple historical sites, a massive state park, and lots of hiking and wildlife-viewing opportunities. 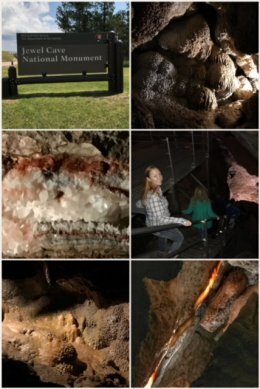 We started this leg of the adventure at Wind Cave National Park, #18 on our list of national parks visited since our trip began in January 2018, a park neither of us had ever visited, and one that protects one of the most complex and densest maze caves in the world — as well as one of the last mixed-grass prairies (with prairie dogs and bison) in the country. It was established in 1903 by President Theodore Roosevelt as the seventh national park — and the first cave to be designated a national park. It encompases and protects 28,295 acres. The park offers multiple (fee-based) cave tours, so of course, a cave tour was the first thing on our agenda. Guided cave tours are offered year round on a first-come, first-served basis, though not all tours are available in all seasons. The main tours are Natural Entrance (the tour we took), Fairgrounds, Garden of Eden — all of which last an hour or more with lots of stairs to climb. Special tours include the Candlelight Tour and the Caving Tour. We enjoyed our tour, though we found our caving experience more fun at its sister site, Jewel Cave National Monument. The Natural Entrance Tour starts at the cave’s original natural entrance (discovered by brothers Tom and Jesse Bingham), before taking an elevator down. While there are 300 stairs on this tour, most are down — and you take an elevator back to the top. This tour highlights Wind Cave’s most prominent and noteworthy feature named boxwork. Popcorn and frostwork formations can also been seen with this tour. 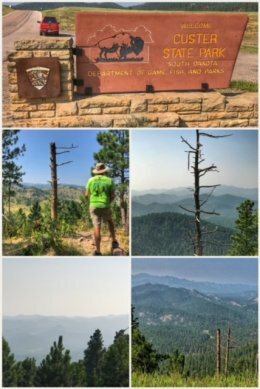 Besides the cave tour, we took the time to hike the 1-mile Rankin Ridge Trail, which takes you up to the highest point in the park — and a fire tower — offering amazing views of the surrounding areas, though our views were slightly obscured because of haze and smoke from all the wildfires to the west. The drive up Highway 87 to the hike is also beautiful — and leads you directly to Custer State Park, the state’s premier park, protecting 71,000 acres. The park includes bison and other wildlife, scenic drives, campgrounds, lodges, visitor centers, lakes, historic sites, interpretative programs, and beautiful vistas. We drove up to the Mount Coolidge Fire Tower — completed by the Civilian Conservation Corps (CCC) in the late 1930s — for some amazing (though smokey) views. The entrance fees to the park are a bit steep for people like us who were just driving through, but certainly reasonable for folks who plan to hike, camp, and enjoy the lakes. 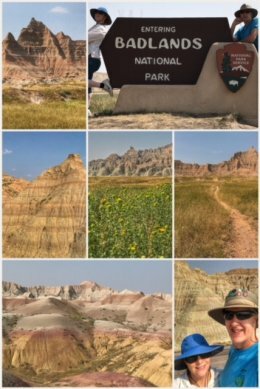 Next up was a return visit to Badlands National Park — #19 on our list of national parks visited on this trip. We approached the park from the south rather than from the north and I-90 (how most folks enter the park), and saw some different views of the badlands. 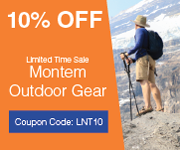 And even though we had been to this park just last year, we stopped at the visitor center and watched the short video before venturing back out into the 90+-degree heat to hike some of the amazing elements of this 240,000-acre national park. According to the video, the badlands are disappearing (eroding) annually, and one day (in the pretty distant future) the badlands will be gone. Dr. John Evans, an early explorer, said the area reminded him of “some magnificent city of the dead, where the labor and the genius of forgotten nations had left behind them a multitude of monuments of art and skill.” Not sure we felt the same, but we did enjoy the beautiful colors and formations. While the park has much wildlife, including bison — and the reintroduced native black-footed ferret — the only animals we saw on this trip to the park was our beloved blacktailed prairie dogs! Note: Badlands National Park also includes a South Unit (which was used as a bombing range during World War II). The unit, which is mostly undeveloped, is located next to the Pine Ridge Indian Reservation and the land is considered sacred to the Oglala Sioux and Oglala Lakota. Access is limited and requires crossing private land. 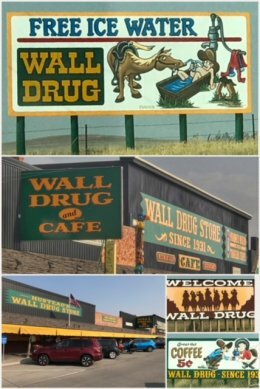 On our way back to camp, we had to finally make a stop at Wall Drugs, an icon along I-90 — and one for which you see many, many billboards along the way. The massive (76,000 square feet) conglomerate of food and gifts had a humble beginning in 1931 when Dorothy and Ted Hustead bought a small drugstore. 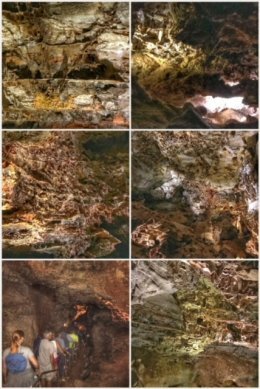 While the boxwork formation of Wind Cave was cool, we found the diversity of Jewel Cave — its many jewels of calcite crystals — made it a more fun tour. Jewel Cave is currently the third longest cave system the world — at 192.99 miles of mapped passageways. The map of these passageways will completely blow your mind — and experts says more passageways exist but have yet to be discovered. As with many other parks and monuments in this area, Jewel Cave became a national monument when President Theodore Roosevelt designated it so on February 7, 1908. Jewel Cave, like Wind Cave, was also discovered by two brothers — Frank and Albert Michaud. 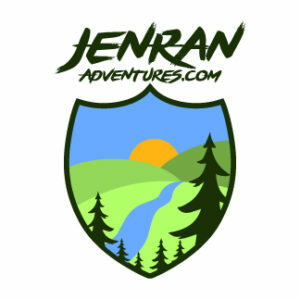 We enjoyed the Scenic Tour, the main cave tour offered, but there is also the Historic Lantern Tour and Wild Caving Tour. After finishing our cave tour, we also hiked the the Roof Trail, a .25-mile loop that includes a beautiful overlook of the forest and canyons surrounding the cave. 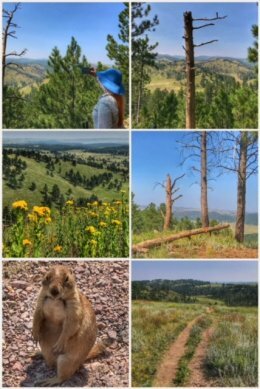 More adventurous folks can hike the Canyons Trail (a 3.5-mile hike from the visitor center to the historica entrance of the cave) or the Hell Canyon Trail (a 5.5-mile hike in the Black Hills National Forest). 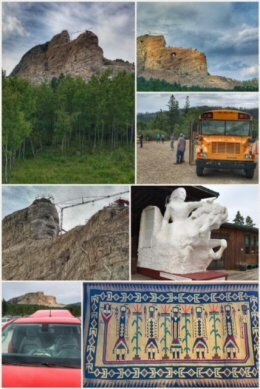 We ended the exploration part of this stop with a visit to the Crazy Horse Memorial, one neither of us had ever visited. This massive sculpture of Crazy Horse riding his horse — which will be 563 feet tall when completed — has been under development for 70 years, and is expected to not be fully sculpted until 30-50 (or more) years. The project is the work of sculptor Korczak Ziolkowski and his heirs — in collaboration with Chief Henry Standing Bear and some of Chief Crazy Horse’s descendants. The monument and visitor complex have been completely funded by private money — and will continue that way, partly through the entrance fees. Besides the sculpture, the organization also manages the Indian Museum of North America and the Indian University of North America. Our time in the Black Hills was truly wonderful — and in our next blog post we are going to examine the economic impact of our visit here, as we also visited wineries, a farmer’s market, and got both our vehicles serviced — in addition to staying in a campground and a local hotel.